When strong gusts of wind are carrying the sounds of war, let us remember the costs of freedom. In 1876, Frederic Auguste Bartholdi was commissioned to create a sculpture to commemorate the centennial of the American Declaration of Independence. This sculpture, The Statue of Liberty, was gifted by the people of France to America in recognition of the friendship established between France and America during the American Revolution. 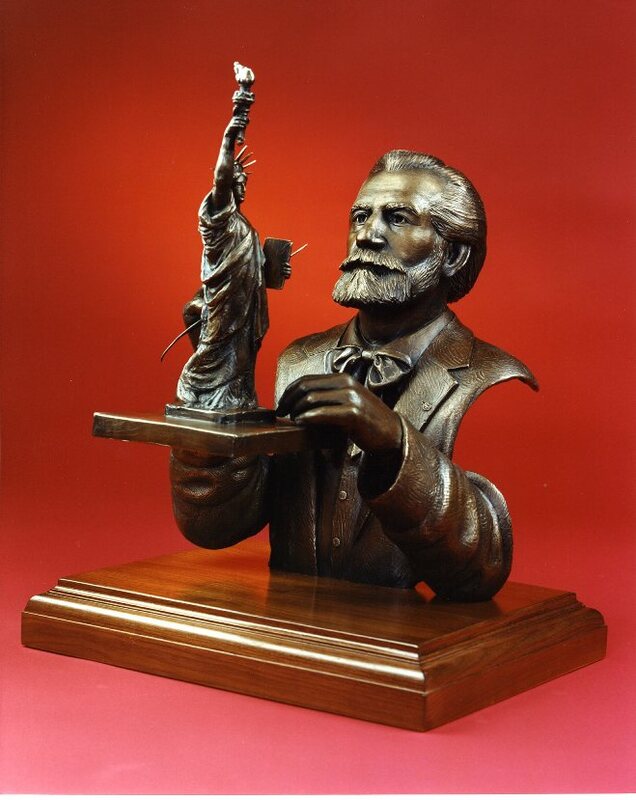 In 1985, sculptor Don Wiegand was commissioned by the Statue of Liberty – Ellis Island Foundation through Fine Art Ltd., St. Louis, Missouri to sculpt and cast Frederic August Bartholdi (Sculpting the Maquette of Lady Liberty) for the 1986 reopening and centennial celebration of the dedication of the Statue of Liberty. The first bronze cast is on exhibit in the Bob Hope Library on Ellis Island. According to the National Park Service, the idea for the Statue of Liberty was first proposed by Edouard de Laboulaye, a prominent political thinker and president of the French anti-Slavery Society. An essay on the website suggested that as a result of the abolition of slavery and Union’s victory in the Civil War, Laboulaye hoped that the French people would be inspired to call for their own democracy in the face of a repressive monarchy. Later in 1903, Emma Lazarus’ poem, The New Collossus, was inscribed on a bronze plaque within the pedestal of the Statue of Liberty. The poem captured the nation’s imagination and continues to shape the way we think about immigration and freedom today. Freedom is not free. The ultimate price has been paid by many, too many of the best and brightest. Many years ago at a WWII memorial I read the simple words “Lest We Forget”. Sometime later I came across helmets that covered the ground by the thousands. My desire was to give these forgotten relics shape and form of a soldier so that in some way the forgotten will be remembered. Freedom to express one’s creativity and vision is a freedom I’ll never take for granted. I honor those who have fought for our country and those who earn our freedom each day. My art brings a sense of calm and peace to my world. By creating “colorfield” paintings constructed of 6-7 layers of overlapping colors, I use a process rich with detail. What looks like one simple color to the initial glance, becomes more complex upon closer inspection. I see balance, harmony and happiness. What do you see? more times, you’ll get the 1.3″ orange stripe on the side. Use your phone and do the math. Freedom means a variety of things to every person. Childhood freedom can be gone in a flash and then turn into how children fight for our nation’s freedom. 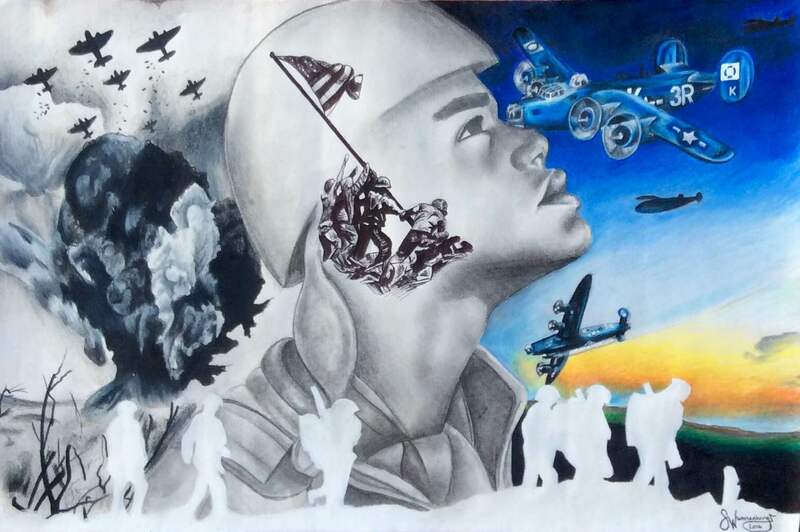 I had the privilege to get to be in Normandy for a D-Day anniversary and there was a point when there was a young boy who had put on his grandfather’s military attire and sat there looking so proud and that memory is what inspired this work. Freedom is deeply rooted in all of us if we dare look for what it means, and when looking at this work, viewers may not receive the same story that I made, but that is okay. I would love for everyone to walk away from this work with a new idea of what freedom could stand for, for them to search themselves and ask the questions that need to be asked. I did not get a chance to say goodbye; I did not have an opportunity to grieve; I died with my friends. Each took a piece of my soul from me; I robbed me of my soul; Replaced it with guilt; I am forever taken. 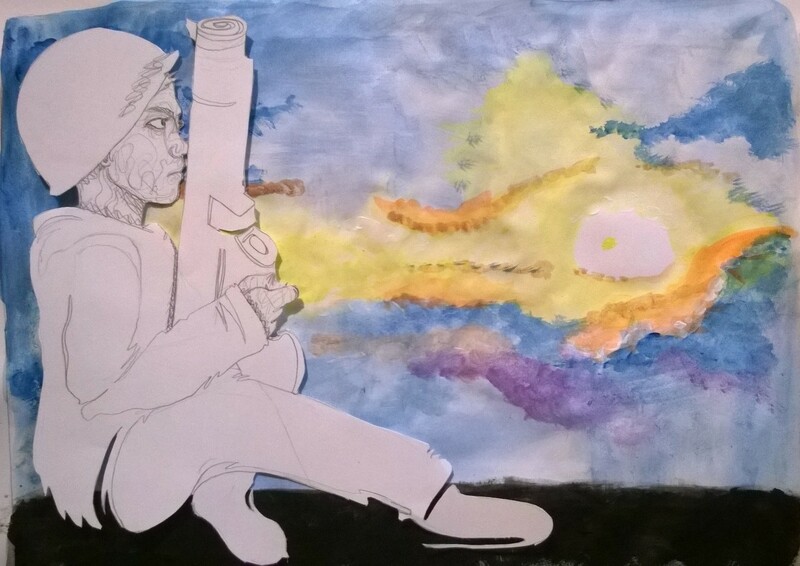 It crushed what God built; Art is the light that God shines on me; Art is the path my journey freed. Piece by piece it connects me; Back to the soul that was taken from me; Forever vigilant will I be; with the art that God has given to me. I am a PTSD survivor with 23 years of active duty army service. Art has freed me from the symptoms of PTSD! Freedom is to be claimed, and then to be practiced. The man drawn in pencil, his race now unidentifiable, shows freedom doesn’t discriminate. The image of the flag raising from Iwo-Jima is the iconic symbol of struggle for freedom. It’s is in his head because it’s being imagined. 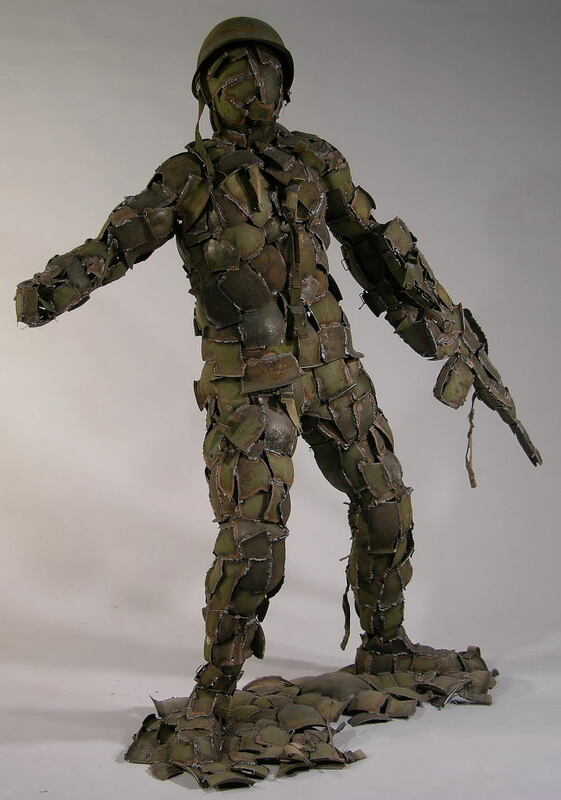 The “soldier” has seen hope for freedom and sacrificed to achieve it. In the background (right side) are the planes before war and (left side) during destruction. Not drawing the scenes in normal right-to-left stands for the backwardness of war: destroying anything to gain everything, doing bad, arguably, for a greater good. Including the beauty before and ruins after in detail to show freedom surrenders beauty environmentally also. The last scene is the white troops who stand for the faceless character of the struggle for war. People rarely think of the tremendous sacrifice that earns freedom, only the outcome. Freedom is not only a concept or a list of laws that allows us to speak our minds, but it is living and breathing. Freedom is not only a what but a who, a brother, a son, a friend. This image depicts someone very close to me; someone I have known for a while. As any viewer could easily guess, this man is a United States Marine. He is entrusted to keep his country and family safe: he has been taught by the United States Government how to do exactly that without thought for his own life, simply that of others, and to be selfless in times of crisis and to do everything in his being to uphold the freedom that we have. That is Mark. 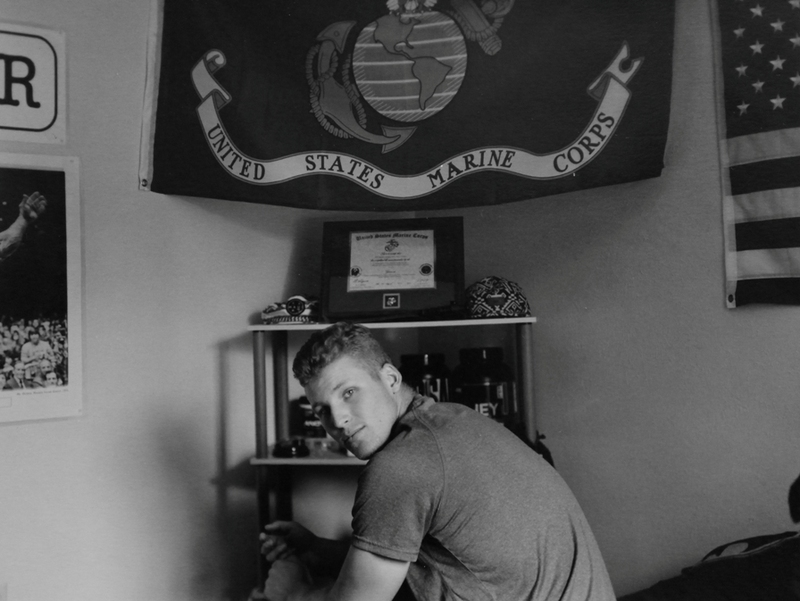 In this image he is overpowered by the Marine Corps name and symbols, but when looking closer there are other things that clue the viewer in to what else makes up Mark. The edge of a sign that says “I heart Beer” and the arm of Arnold Schwarzenegger in a poster can be seen on the left, or the whey protein in the back because he likes to powerlift. However, by just seeing the slivers of them included in the picture no one would ever know that’s what they are or what they mean to him as a person. All that matters in the never-ending quest for freedom is him and the sacrifices he is willing to make in its name. This images shows just one of the faces of our freedom, and who would give anything to protect the ones they love, and to draw attention to the careful fragility of the life underneath the uniforms. 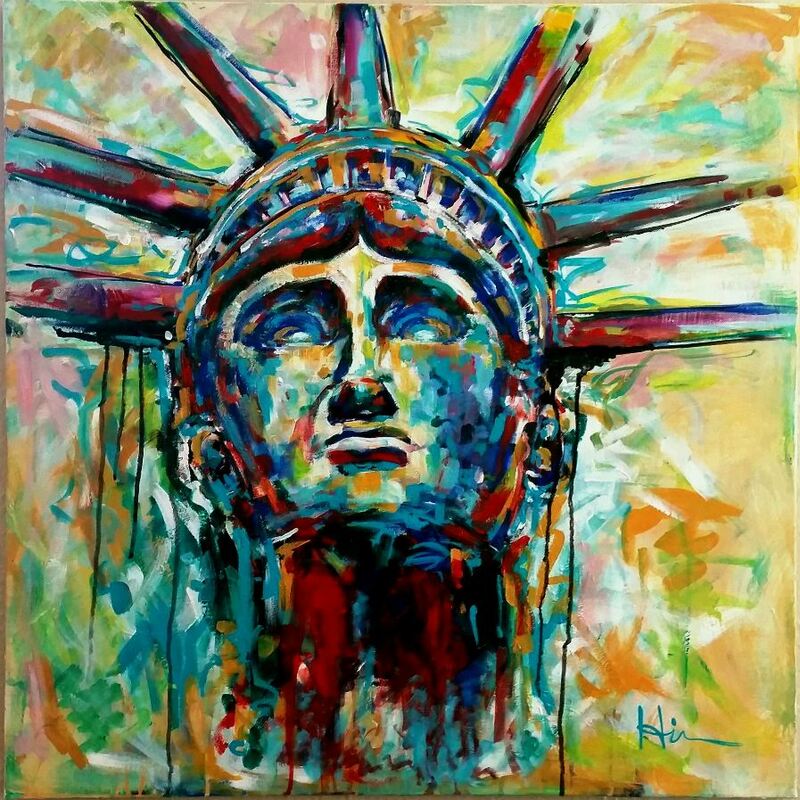 While the Statue of Liberty is generally viewed in a full patina copper color, this image of the iconic Freedom landmark offers a rich color palette and focuses solely on the head and face. The spectrum of color used in this piece celebrates the diverse backgrounds of the citizens in the US while the crimson near the base of the neck is a reminder of the sacrifices made to defend our freedoms and support our diversity. 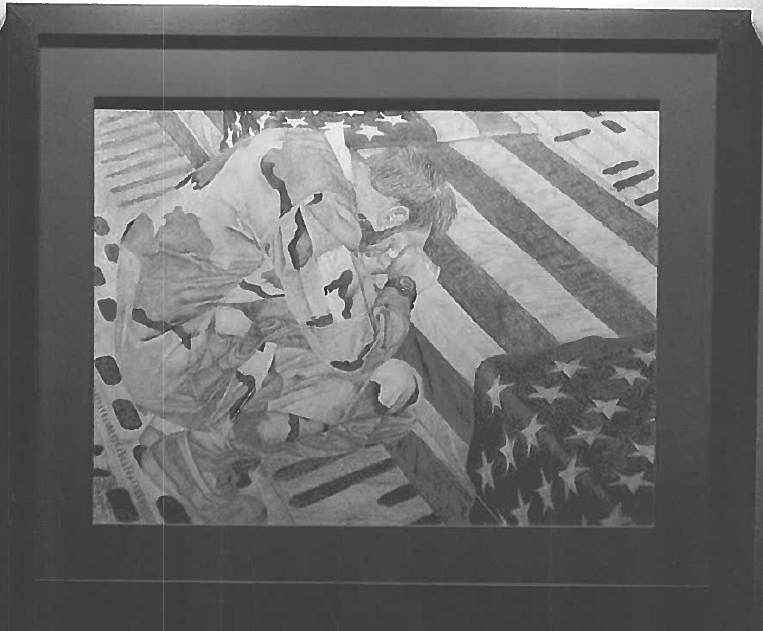 In this painting, there is the struggle with the idea of the cost of freedom and the reality of freedom. The subject was in the military and had mixed emotions about what freedom was to the individual. 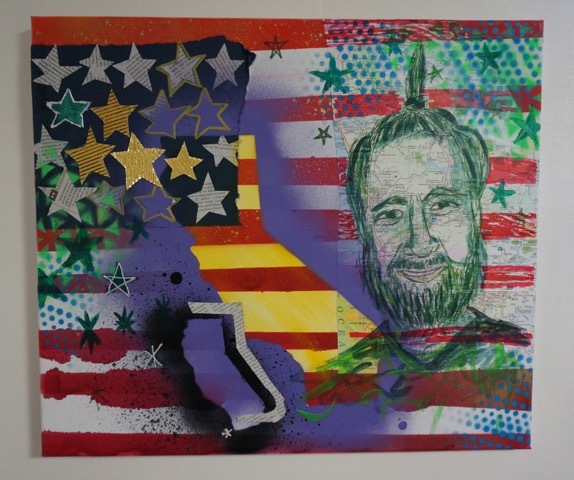 For the subject, fighting for freedom was his job and he was honored to do it, even at the cost of his health and safety, but freedom for him was getting out of the military and continuing life as a civilian: growing a beard, living on his own land, leaving his home without asking permission, and even having the freedom to smoke marijuana in his own home as he coped with his back pain. This work allows the viewer to feel his appreciation for freedom without being direct or offensive.